The attendees of the upcoming meeting will discuss and provide guidance to the ongoing research studies that are currently being undertaken by MSA programme. 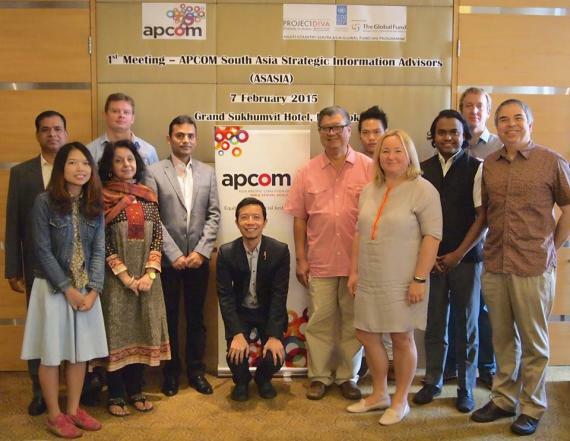 On 7 February 2015, APCOM hosted the inaugural APCOM South Asia Strategic Information Advisors (ASASIA) meeting. The advisory group consists of a group of regional experts with experience in policy, research, program development and organisational management. Also in attendance were key members form APCOM Management and UNDP Bangkok Regional Hub.The role of ASASIA is to function as a peer review for all the knowledge generated under the Multi-Country South Asia (MSA) Global Fund HIV Programme, including knowledge products, research studies, strategic plans, etc. Additionally, ASASIA will contribute to the achievement of APCOM’s core mandate on development of strategic information and explore opportunities to strengthen Strategic Information beyond the Programme. The meeting identified several key area gaps as well as suggestions to narrow them. A mental health service delivery gap is reported consistently accross communities in South Asia. Scaling up the number of counselors and training them on how to adress mentalh health through understanding and appreciation of sexual health rights and gender role was concluded by the participants as an imperative intervention to narrow the gap. Low access of transgender and hijras communities to the service was as well identified. Notable action points to respond such a gap included establishing culturally and politically relevant intervetions that met the unique conglomeration of these communities. Counterproductive impact of faith was considered to add another layer of the gap. The meeting, consequently, recognized the importance of expanding consultation and cooperation with faith-based leaders who were willing to capitalise on the respect they commanded within society to challenge stigma and encorage people to care for and support the populations at risk. Lack of support for young LGBT individuals was as well reviewed. The participants concluded that provision of pratical guidance on how to respond to sexuality and gender role of young LGBT people was needed at primary, secondary and tertiary levels of the education system. The meeting also reviewed ongoing research studies under the Multi-Country South Asia Global Fund HIV Programme and knowledge products produced thus far under the grant, as well as explored potential topics and areas of focus for future APCOM and country partner knowledge products. Recommendations to feed into Expression of Interest (EOI) submission for continuation of the grant under the GF New Funding Model (NFM) were also explored in the meeting. Echoing the key gaps discussion, the recommendations included expanding and integrating service delivery, strengthening advocacy engagement, invigorating community capacity building and developing research studies and strategic information. The next ASASIA meeting is scheduled for May 2015. The attendees of the upcoming meeting will discuss and provide guidance to the ongoing research studies that are currently being undertaken by MSA programme.